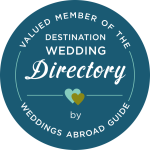 Based in Hertfordshire, England Kate started her bespoke destination wedding stationery company in 2008. One of the first designers specialising in destination stationery, Kate has refined her craft and produced invites for thousands of weddings all over the world. With a passion for design, an obsession for print and a unique style Kate deserves her place as one of the best wedding stationery designers. The design process begins with email conversation or phone/skype call where we can talk about your ideas, inspiration and all your paper needs. Once you’re confident that we understand your ideas, we will email over an estimate for the project. Once you’ve reviewed the estimate and decided that you'd like to proceed, we'll provide a link to the Terms and Conditions which outline the details of your project and request a 50% non-refundable deposit to begin designing. Within 4 working days of receiving your signed T&Cs, payment, wording and design requirements for your stationery, we’ll send a digital PDF proof of your design. Now, you’ll review the design, sleep on it maybe, and then give us your feedback / amendments. We’ll perfect your design through up to three rounds of revisions provided as PDF proofs via email. Additional revisions after the first three can be completed at an additional cost of £25 GBP ($35 USD) per revision/PDF proof fee. We’ll provide a final, print-ready proof for your review. This is when you check closely for correct spelling and details. We require approval of the final proof by a written statement sent via email. At the time of your design approval, your balance is due. After all is approved, we’ll prepare and send your project to print. Turnaround times vary depending upon the type of printing you choose. Generally printing, assembly and delivery take two to three weeks. We'll carefully package and send your project on its merry way. If you're looking for custom designed stationery which suits your theme and destination perfectly you've definitely come to the right place. It's been our speciality for many years now. Destination Stationery is the name of the company and it's what we love doing. 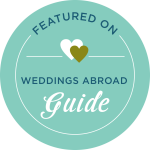 If you're getting married abroad or planning a travel themed wedding or event what's stopping you? Click that contact button and stop wasting your time browsing ideas on Pinterest.